(Skt. prajñā; Tib. ཤེས་རབ་, sherab; Wyl. shes rab), the sixth of the six paramitas, defined as the precise discernment of all things and events. (Skt. jñāna; Tib. ཡེ་ཤེས་, yeshe; Wyl. ye shes), which is sometimes translated as primordial wisdom. One of the two accumulations. "Sherab consists of the syllable ཤེས་ shé, which means ‘knowing’ and རབ་ rab which means ‘excellent’ or ‘best’. So it is the best knowledge, the best form of knowing. It is knowing correctly, clearly and fully." "Wisdom is identified as the recognition during the formal meditation session that all phenomena are empty, and the knowledge during the post-meditation phase that all phenomena are unreal, like a magical illusion or a dream." "Through the wisdom that comes from hearing, you are able to recognize the disturbing emotions. Then, through the wisdom that comes from reflection, you are able to overcome the disturbing emotions temporarily. And finally, through the wisdom that comes through meditation, you conquer completely the enemy of negative emotions and obtain the confidence of knowing inexpressible and inconceivable reality with the wisdom of discriminating awareness." "In the word ཡེ་ཤེས་, yeshe, ཡེ་, yé is short for ཡེ་ནས་, yé né, which means ‘right from the beginning’ or ‘primordially’. Some people translate it as ‘pristine’ or 'pure', meaning that it is untouched and unstained, and has been there all the time. It is the way it always was. So yeshe is discovered with ཤེས་རབ་, sherab. 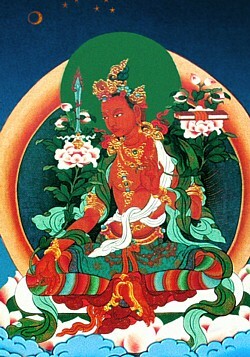 Yeshe is understood by sherab, or approached by sherab." "The difference between sherab and yeshe is very subtle and slight. But I think we can say that yeshe is the most natural state of our awareness or consciousness, which is unstained, uncontrived and completely ordinary. It is there all the time, but we don’t recognize it. It is sherab that brings about the recognition, but of course they are not two separate things." "The Tibetan words sherab and yeshe appear again and again in [the teachings] because they are connected with enlightenment. It is important to give an explanation of these words because of the tendency to materialize and separate them, which is incompatible with the meaning of Dharma, which is to make noncontradiction." Thinley Norbu, A Cascading Waterfall of Nectar (Boston & London: Shambhala, 2006), pages 158-161. This page was last edited on 24 October 2017, at 09:52.